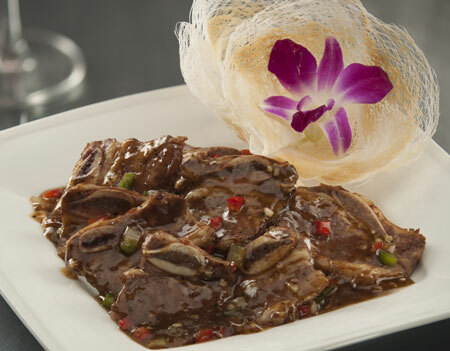 Simple yet delicious, come experience hot spicy taste and juicy textures of stir-fried US beef ribs with black pepper sauce, a recipe from chef Tuan from May Man Restaurant. Add tomato ketchup, sugar, soy sauce and Lea & Perrins Worcestershire sauce into the pan. Heat oil in a pan then pour over wheat flour in another pan, stir well. Add the mixture of oil and wheat flour into the saucepan, then stir well. Marinate US beef ribs with chicken powder, seasoning powder, sugar, tapioca starch, Lea & Perrins Worcestershire sauce and cooking oil in 15 minutes. Saute marinated US beef ribs in a pan for 30 seconds. Add special black pepper sauce into the pan and stir well. Arrange US beef ribs with black pepper sauce to the serving place. You can sample the dish at Fortuna Hotel Ha Noi, 6B Lang Ha St, Ba Dinh Dist, Ha Noi. For information and reservation, kindly contact (04) 3831 3333 - ext 6260/6461 or visit fortuna.vn.